The Vikings are invading York! Next February sees the Jorvik Viking Festival take place once again. And once the battle is over on Saturday 18th Feb, the mighty Faroese Viking Metal band Tyr will be performing their first ever U.K headline show. Could there be a more fitting culmination to this event? We think not! The concert, in association with Asgard and the Jorvik Viking Festival will take place at Fibbers on Stonebow – a mere axe throw from the famous Viking Centre itself. 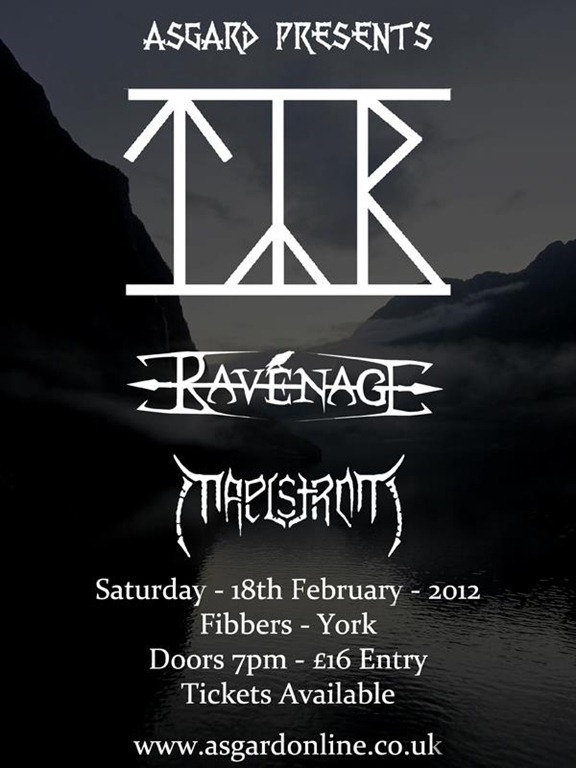 The line-up is confirmed as Tyr, with support from Yorkshire heathen metallers Ravenage and the Glasgowegian black metal band Maelstrom. Asgard Online are also sponsoring Valkyrian Festival 2011. The Macmillan fundraiser event known as “Valkyrian Festival” is now being sponsored by Viking crafts online store Asgard Online, the Viking metal-wear specialists. Valkyrian Music editor Nico Davidson [Real name Nick Taylor] had the following to say: “We’re extremely grateful that Asgard Online have chosen to sponsor the event and it’s exciting that our first event has received sponsorship”. Asgard Online will also be donating two t-shirts that will be used as prizes in the raffle at Valkyrian Festival. For more information regarding Valkyrian Festival, click here.